For the Love of Food: Southern Breakfast Scramble Pizza with Mama Mary's and a Giveaway! Southern Breakfast Scramble Pizza with Mama Mary's and a Giveaway! It's Day 2 of this fun Recipe Challenge and Voting Contest with Mama Marys Gourmet Pizza Crusts! Once a day this week I will post five fun "out of the box" pizza recipes using Mama Mary's Pizza Crusts. Simply scroll to the bottom of this post and vote for your favorite and enter the contest below! One lucky reader will win a $100 VISA gift card and VIP Product Coupons for Mama Mary's. Here's some more exciting news: the winning pizza recipe chosen by my readers and Mama Mary's fans will be featured on Mama Mary's products in stores nationwide! Who doesn't love breakfast for dinner, right? That's where this pizza idea for Southern Breakfast Scramble Pizza came from. Pack all our breakfast faves onto a pizza: fluffy eggs, crispy hash browns, gooey cheese, and bacon...you can't go wrong with bacon! All piled high and baked on a pizza crust! 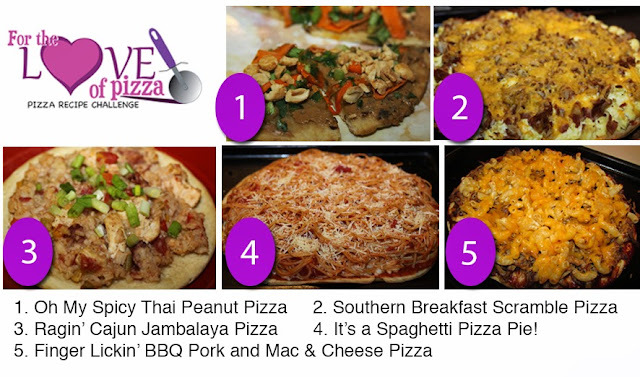 Scroll down to see all five pizzas and comment and vote for your favorite. Then you are entered to win! 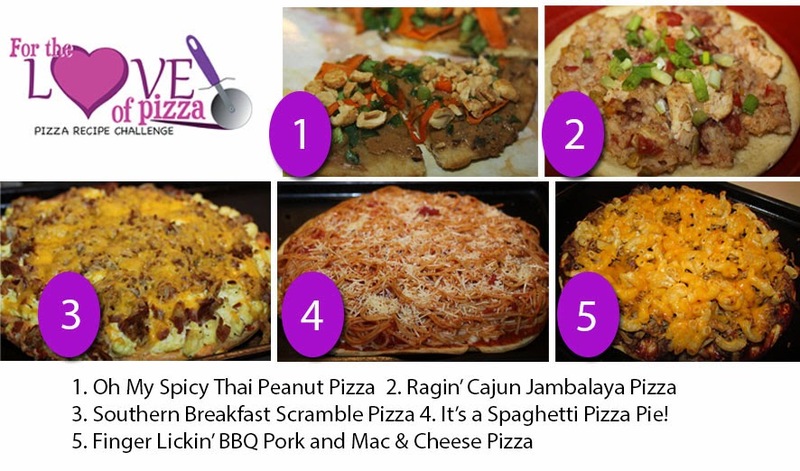 Come back tomorrow for the next recipe- Ragin' Cajun Jambalaya Pizza. In a large skillet cook bacon slices until crispy then remove to a paper towel lined plate to cool. Chop into bite size pieces and set aside. Meanwhile heat a tbsp of oil in a large skillet over medium heat. Add hash browns, spreading in the pan so it is an even layer. Cook until crispy on one side, about 5 minutes then flip and cook other side, pressing down and adding more oil if needed. In a large bowl whisk eggs, milk, and salt and pepper together. Coat a pan with non stick spray and heat over medium heat. Add eggs and cook, stirring, until cooked through and scrambled. Finally, in a small saucepan mix together 1 cup shredded cheddar cheese, pimentos, cream cheese and hot sauce and heat over med low. Stir until melted then remove from heat. Place Mama Mary's Large Pizza Crust on a baking sheet or pizza pan. Spread melted pimento cheese to cover the top of the pizza crust. Top with egg, piling high then add chopped bacon. Next add crispy hash browns. Remove, add 1 cup shredded cheddar cheese on top, then bake for an additional 5 minutes. The perfect ingredients for a breakfast pizza: eggs, hash browns, and bacon! Cook bacon until crispy then drain and chop. Whisk eggs with milk and salt and pepper. Cook eggs until fluffy and scrambled. golden then flip and cook other side. can also use their personal mini pizza crusts for individual pizzas! Easy Pimento Cheese Spread: Melt cheddar cheese, pimentos, cream cheese, and hot sauce in a saucepan. Spread the warm pimento cheese on the pizza crusts and cover completely. Spread bacon on top of eggs. Top with hash browns and bake at 425 degrees for 5 minutes. Top with cheddar cheese and bake for an additional 5 minutes. Hot out of the oven and ready to eat! This Southern Breakfast Scramble Pizza is a delicious meal for breakfast, lunch, or dinner. Is this your favorite pizza recipe? Comment below and enter to win! What pizza is your favorite? and like both Facebook pages to be entered to win! The Southern Breakfast Scramble Pizza sounds delicious. Something everyone in the family would enjoy! It's a Spaghetti Pie! pizza is my favorite!